The ANSO SuperScreen Premium Outdoor Series are smaller, thinner, lighter and use a vertically arranged pixel to produce the sharpest image possible! The advantage of vertically arranged pixels is a Wide viewing angle and no colour fringing if you are on the left or right side of the screen. This high performance LED screen combines 'pixel sharing technology', high 5,500 Nits brightness and advanced light trap louver's to provide brilliant video quality in all conditions. Our Premium Outdoor Series start from 5m2 up to whatever size your imagination can handle. At ANSO SuperScreens we pride ourselves on continuous improvement, which is why we have introduced this ulta light premium product for those with performance in mind. These BIG video screens are built for the Victorian climate with weatherproof ratings of IP65 front and IP54 rear. Which means no matter how nasty the weather your SuperScreen will always perfom. Sunlight is the largest enemy of any video display, except ours! With 5,500 nits brightness, our outdoor series can still perform in direct sunlight. We also use 'Pixel Sharing Technology' which translates to, each video pixel being shared with the ones around it at a very fast rate. This tricks the human eye into seeing more resolution than the physical device is capable of. In other words, better picture, less expense. The Premium Outdoor Series is available in 10mm, 12mm (v6), 15mm (v7.5) & 20mm (v10mm) pixel pitches. 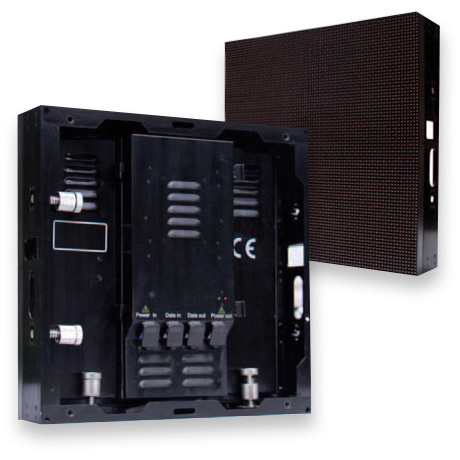 All varieties in The Premium Outdoor Range use a standard design & standard components, they use industry-standard power and signal interconnects to reduce display downtime and replacement costs. IP65 Complete weather defense - Offers complete protection against dust, water, moisture, corrosive precipitation. Extremely Bright Screens - 5,500 nits brightness means that it can stiil be watched even in full sunlight. Pixel Sharing Technology - It doesn't quite double the resolution of your screen, But it DOES LOOK TWICE AS GOOD! Vertically arranged pixel - Wide view angle and no left-right colour shift aberration. Advanced video processing - Provides 16 bit image processing for 281 trillion colors resulting in a crystal-clear picture with true-to-life color reproduction. Tight selection of LEDs - to give uniform colors across the entire display surface. Ultra Light – only 64 kg per square metre. Seamless Construction - Cabinets made of precision extruded aluminum for a completely seamless finish. When selecting an outdoor Super Screen pixel pitch, for every 1mm of pitch the audience should be 1m away.